Like a hot knife through butter. 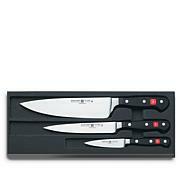 Grab the steel of choice: The chef's knife is the go-to knife for many hefty tasks, the utility knife is just that and the set of steak knives will keep your guests covered. Add a pair of kitchen shears for snipping and a nine-inch sharpener for sharpening, and you're ready to tackle nearly any cutting task. 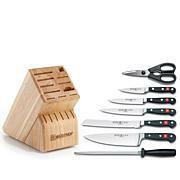 Bought this set of knives for hubby - he loves to cook! He thinks theyre great and hes gone through lots of other sets. High quality, sharp etc. Reasonably priced considering the high quality. I received a set of these knives for Christmas. 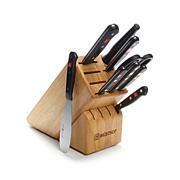 Oh they are the sharpest knives I have ever had in my kitchen. I love how they are not heavy, they are light weight, and easy to hold on to while cutting. 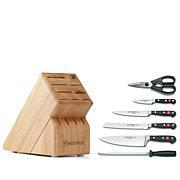 The only thing I don't get, is there are two slots in the knife block that are empty. Just the weight of the knife will cut through a huge ham with ease. I love the knives! Was s gift for my boyfriend . He wanted this set and he was so happy. 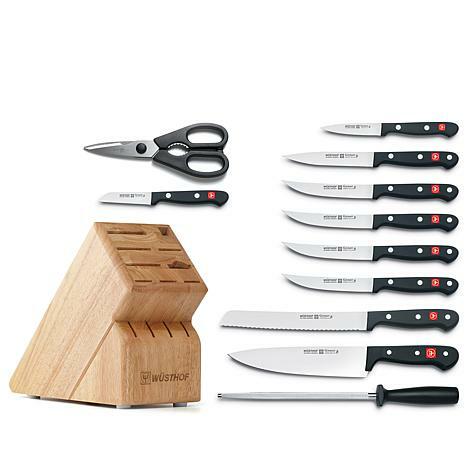 Beloved to cook and said this brand of knives is great quality. Got these for my husband and he loves them!!! So sharp! Will cut up anything. Block set holds them perfectly. Great to have in your kitchen. Everybody needs a set of these.